We are taking a break from Phono Preamps for a while. There is no more Maxxed-Out or Trio product left in stock. Our goal is to now spend time developing a new design that is superior to either of these, but no more complex than the Trio. Tall order, but it seems like the right direction to go in. The basic design of the Maxxed-Out Phono Preamplifier has been the mainstay of K&K Audio phono preamp kits since 2003. Over this time we have relentlessly worked to substantially improve the sonic performance of this topology through the use of improved component parts and additions to the basic topology that have removed performance limitations. All of these improvements have been embodied in the latest versions of the Maxxed-Out Phono Preamplifier Kits presented below. If you check the forums for comments on the previous designs you will find posts comparing these units in a favorable light to much more expensive commercial products. While we won’t make a claim that you can’t get a better phono preamplifier for $20K or $30K, we do believe that you will have a great deal of difficulty finding either a better phono preamp, period, or finding a better “big name” commercial product for less than a few times the price of the Maxxed-Out Phono Preamp. 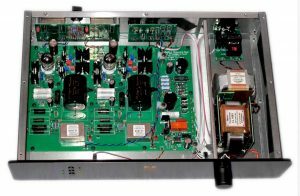 A recent “rave” review of the Maxxed-Out Phono Preamp equipped with 2 x MC inputs and silver wire MC input transformers can be viewed here: http://www.positive-feedback.com/Issue77/kandk.htm. The Maxxed-Out Phono Preamp is equipped to handle moving magnet or moving iron cartridges and, for moving coil cartridges, an input transformer is included to step-up the lower cartridge output voltage. The circuit was developed to combine the best qualities of tubes and semiconductors and achieve a better result than could be had with either technology alone. The first stage for a moving magnet cartridge consists of a MOSFET / triode (6N23P/6DJ8/6922/7308) cascode amplifier loaded by a cascode constant current source. This stage is capable of very high gain (about 50dB) with very low noise. An all tube cascode could have been used, but without the simplicity and noise performance of the hybrid approach. The hybrid cascode drives a precision passive RIAA network. This feeds a cascode constant current source loaded triode that is transformer coupled to the outside world using the parallel feed configuration. The lack of DC in the output transformer primary allows the use of a superbly transparent cobalt amorphous core Lundahl transformer. Because the output is transformer coupled, both balanced (XLR) and unbalanced (RCA) connections are supported, achieving the same excellent sound. 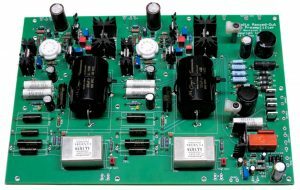 The power supply is a robust, low noise choke-loaded design augmented by a very effective shunt voltage regulator in each channel to completely remove the sonic effects of power line quality and noise on LP playback. The Maxxed-Out Phono Preamp uses Lundahl audio and power magnetics, Mundorf Silver/Gold Oil, Cardas, Panasonic, and Elna Silmic II capacitors, Teflon/collet style tube sockets, Audio Note and Shinko tantalum resistors, Cardas and Neutrik connectors, and semi-custom Grayhill gold contact switches for the best sound, period! There are several options for customization of the Maxxed-Out Phono Preamp. These options fall into three classes, Appearance options, parts quality options, and functional options. These are described here and further below. The Phono Preamps is available with a semi-gloss black powder coated front panel or a metallic silver powder coated front panel and anodized knob to match. The finished dimensions are 18″ (46cm) wide, 13″ (33cm) deep, and 4″ (10cm) high. The Maxxed-Out Phono Preamp weighs about 23 lbs. (10.5kg). 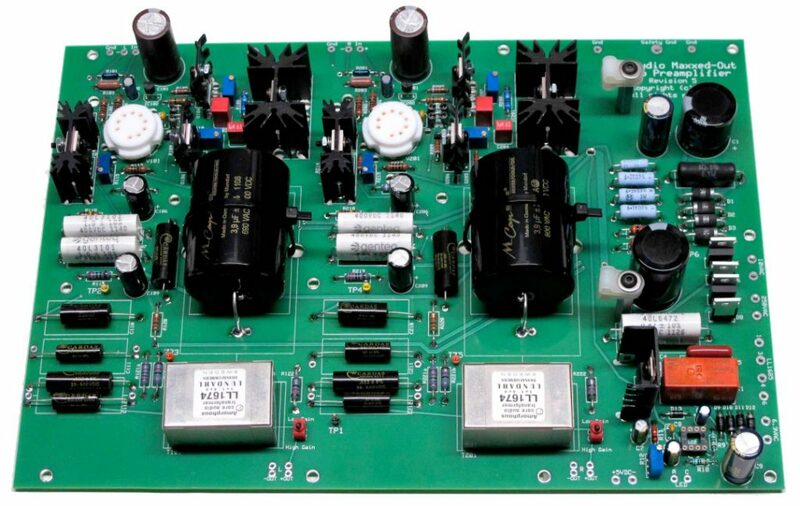 See the K&K Audio Maxxed-Out Phono Preamp schematic here. There are several options for the Maxxed-Out Complete Kit that can be easily installed at the time of building the unit. On a special order basis (more time and, possibly, more cost) other values can be supplied. The MC transformer can be chosen from these: LL1681, LL1931, LL1933, LL1941, LL1943, LL1931Ag, LL1933Ag, or LL1941Ag. Only one MC input transformer can be accommodated per channel, so only one MC step-up setting is available for both MC inputs in the case of a 2 x MC input unit. We will be happy to discuss your requirements and advise you on the best choice for your particular needs. A single button is added at the bottom of the stack on the front panel for input switching. See the pictures below for the front and back panel configurations. For the ultimate sonic resolution with a fine MC cartridge, the Lundahl MC transformers that are wound with highly pure silver wire are unmatched. Three models are available to best configure Phono Preamp’s capabilities to accommodate your system needs.